India and the United States are talking about the South China Sea, but are they ready to hold joint patrols there? Early on Wednesday, Reuters published an interesting exclusive, suggesting that the United States and Indian navies are considering the idea of jointly conducting patrols in the South China Sea. It isn’t explicit if the idea under consideration is a bilateral U.S.-India freedom of navigation patrol, which would require Indian and U.S. vessels to challenge excessive maritime claims, or simply a bilateral passing exercise or other less contentious patrol. Both India and the United States support freedom of navigation, globally and in the South China Sea. In recent years, as I’ve noted at The Diplomat, New Delhi has grown more accustomed to emphasizing the principle in its official statements. 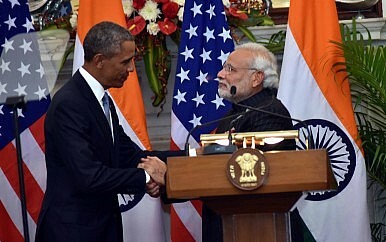 Last January, when Obama was in India for a state visit, he and Indian Prime Minister Narendra Modi affirmed the importance of freedom of navigation. Just this past weekend, Modi, speaking before the 2016 International Fleet Review in Visakhapatnam, reiterated Indian support for freedom of navigation. It’s not surprising that U.S. and Indian officials are talking about the South China Sea. Overall bilateral strategic and defense ties between Washington and New Delhi have been on a steady track of convergence over the past decade and the South China Sea has risen on both their radars in the meantime. India is seeking to “Act East” these days and has pursued a more active sort of diplomacy with ASEAN and its constituent member states. What’s more, India’s 2015 Maritime Security Strategy document and 2009 Maritime Doctrine have classified the South China Sea as a “secondary zone of interest” for the Indian Navy. What’s interesting about this report is what it suggests about how Washington sees New Delhi’s role in the South China Sea. So far, the United States has sought support from its regional allies, including Japan, Australia, and the Philippines, as it has intensified its presence in the South China Sea. Following the October 2015 and January 2016 freedom of navigation patrols in the Spratlys and Paracels respectively, there have been varying calls for multilateralizing these operations going forward. Bringing India into the fold in the South China Sea would serve the U.S. goal of bringing allies and partners together against China’s excessive maritime claims in the area. New Delhi is certainly interested in preserving the freedom of navigation and overflight in the South China Sea, but its interests remain subtly different from U.S. interests in important ways. For instance, India and Vietnam are cooperating on hydrocarbon exploration in the South China Sea. Additionally, any Indian involvement in patrols in the South China Sea would draw a negative reaction from China. India has to consider the idea in terms of its broader bilateral relationship with China. India and China are expanding their cooperation at this time, but their unresolved land border disputes will require any diplomatic capital that New Delhi would otherwise be willing to spend in the South China Sea. So, what’s the bottom line on all this? If the U.S. and India do begin bilateral naval patrols this year, it’s far more likely they’ll happen in the Indian Ocean than in the South China Sea at first. If they do take place in the South China Sea, we’ll have witnessed a big change in how India conceives of its role in East Asia, the purpose of its naval power, and its cooperation with the United States there.